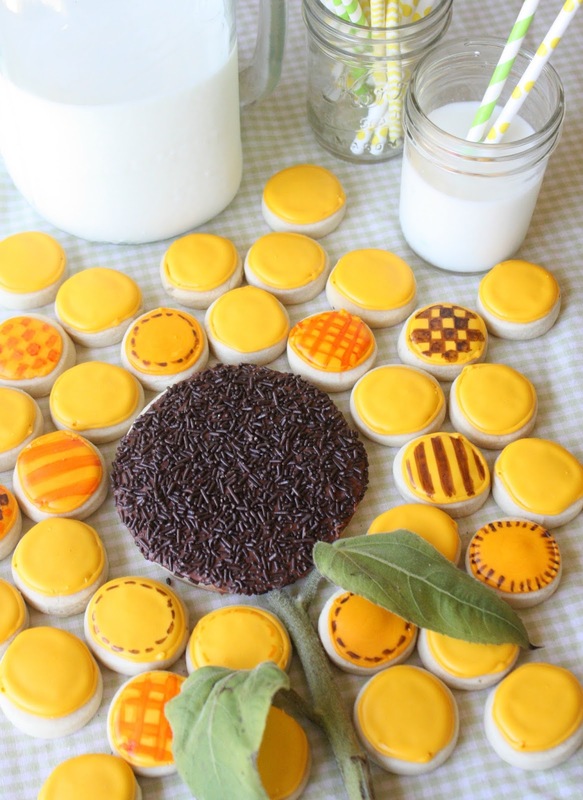 Does this giant sunflower cookie look familiar? Well, my inspiration for it came from Martha Stewart's beautiful sunflower cupcake cake, which you've probably seen. I clipped the photo from her magazine and had it tucked away...until a couple of days ago. This design is so simple and sweet, and I knew converting the cupcakes to cookies would be as easy as pie, or should I say cookies?!? If you have some round cookie cutters of various sizes, you're good to go! For the center cookie I used a 4-inch round cutter, and for the "petals" a 1.25-inch round cutter was used. Of course, you can go as big or as small as you'd like. That's part of the beauty of home baking. Martha (we're on a first name basis, haha) used blackberries to top her center cake, but I frosted all of my cookies with royal icing, and topped the center cookie with dark chocolate jimmies. Like Martha, I did use the stem and leaves from an actual sunflower, which is the perfect finishing touch! 2. Roll dough out about 3/8-inch thick. 3. Using the large round cutter, cut out one cookie from the dough, and place on baking sheet. 5. Bake the cookies at 350 degrees for 13-15 minutes, until the edges just start to brown. 6. While the cookies cool, make a batch of royal icing. 7. Mix some brown gel (AmeriColor chocolate brown) into a small amount of royal icing for the center cookie. Cover and set aside. 8. Mix some yellow (AmeriColor lemon yellow) gel paste into a generous portion of the royal icing, for all of the small cookies. 9. Take a small portion of the yellow royal icing and add a drop or two of orange gel paste to it (to make a golden yellow color for some of the small rounds). Cover and set aside. 10. Outline and fill the large cookie with the brown icing. While still wet, add a generous amount of chocolate jimmies. Set aside to dry. When it is completely dry, shake off the excess jimmies. 11. Outline and fill the small yellow/golden cookies with the royal icing. Let dry completely. 12. Decorate some of the small cookies with orange and brown AmeriColor Gourmet Writers. 13. 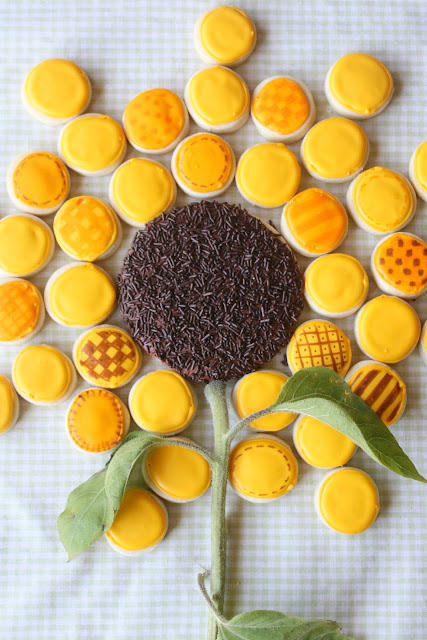 Arrange the cookies to look like a sunflower. Add a stem and leaves from an actual sunflower. This brightened my day! So adorable. I love your markers on the petals and if there are jimmies involved, all the better! So cute! I am going to go look at yours RIGHT NOW! I love this cookie/cookies! Great idea to make cookies instead of cupcakes. LOVE it! This is darling -- what a creative adaptation from the Martha Stewart version. I can see this being so fun for a summer party! So pretty. I like the extra details you added to some of the cookie petals and the chocolate jimmies worked perfectly. 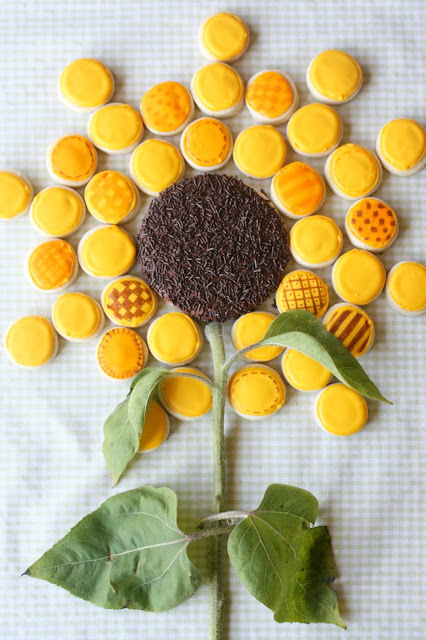 What a beautiful sunflower - I love sunflowers and having it made from cookies makes me REALLY love that flower! I love sunflowers too. And your cookie (s) are adorable! So pretty! Have a great weekend, Sue. I love your sunflower. This is my kind of "cake". Such happy colors. So darn adorable! They look so delicious too! We'd love for you to come over to our newest link party over at The Inspiration Network: DELISH- a desserts only link party. Bring your desserts and let's party!! I am so making this! Sweet sunflower like this will brighten anybody's day.